It's hard being a ten-year-old girl when everyone wants to turn you into a princess. Welcome to the lives of Bella, Grace, Chloe and Emily. When maths whiz Emily Martin's mother enters her in the local beauty pageant, it's the last straw - the four friends form the Anti-Princess Club, with the motto WE DON'T NEED RESCUING. Can they use their awesome skills to show the world that girls want to be valued for more than what they see in the mirror? Samantha Turnbull is a multi-award winning journalist based in Byron Bay and working at the Australian Broadcasting Corporation. Her writing has been featured in publications including ABC online, the Canberra Times, Daily Telegraph, Northern Star, SHE magazine, Cosmopolitan and the Walkley magazine. Samantha decided to get into kids' fiction when she was browsing the book section of a well-known department store and couldn't find anything for her daughter that didn't feature a princess or a fairy. Samantha doesn't like stories about damsels in distress. She likes to read and write about girls who don't need rescuing. 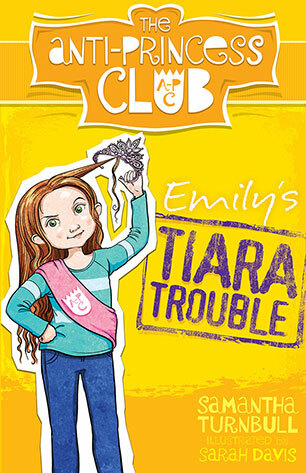 The Anti-Princess Club books are her debut novels. This is a new series of four titles, each one focusing on trying to turn each girl’s parents and teachers away from their preconceptions about what girls should be and do so they can be who they are. Deliberately designed to challenge the status quo and provoke thought, discussion and even debate the series is intent on showing that there is more to life for this age group apart from the ‘princessification’ of their world. While it would seem that such a focus would be redundant in 2015, when we examine the world of the modern 3-9 year old it seems there is once again we have returned to an emphasis on looking and behaving like a princess. Perhaps this has been inspired by the Disney movies of several of the classic fairytales and young girls see themselves as the new Snow White, Cinderella, Aurora, Ariel, Belle, Jasmine, Pocahontas or Mulan - there's certainly enough merchandise to support their dreams - and the more practical, real-life world of girls has slipped by the wayside. This is not just a series for girls though – if we are to challenge and change the stereotypical thinking that is creeping back into our society, they need to be shared with the boys and their underlying message discussed. One of the critical aspects of being information literate is to be able to determine the author’s perspective and identify bias towards a preconceived belief that might shape their writing. Promoting this series of books as a class read would be a perfect platform to start an examination of widely-held beliefs and encourage our students to start questioning the status quo – just because something is common doesn’t mean it’s correct. Big tick to Samantha Turnbull for creating more than just another series of stories for girls. Not only is this on my library’s shelves, it’s also in the Christmas stocking of Miss 9!